The best-selling feminist author and ’93 alumna dishes on growing up grunge, creating a literary canon for the Northwest, and bad men who create great art. In November, during the early weeks of the #MeToo movement, The Paris Review published her essay, “What Do We Do With the Art of Monstrous Men?” In that piece, Claire Dederer, ’93, details her struggle to reconcile her admiration for the work of artists like Woody Allen and Roman Polanski with her disgust for their behaviors toward women and children. The piece came out as the nation grappled with a wave of stories about sexual misconduct. It went viral, was shared around the world on Facebook and reposted on dozens of sites. Dederer was also interviewed about it on National Public Radio. “They did or said something awful, and made something great,” she writes of these “genius” creators. Knowing about the awful thing affected her enjoyment of the great work, whether it was “Annie Hall,” “Chinatown” or “The Cosby Show.” She also writes about the “general feeling of not-quite-rightness” she and women across the country have been experiencing even before the Harvey Weinstein accusations were made public. A New York Times best-selling feminist writer, Dederer is on a roll. She also published a midlife memoir about love, libido, intimacy and identity last spring. In “Love and Trouble: A Reckoning,” she frankly details her experiences with men and boys, including a childhood assault and fumbling mutual encounters when she was, perhaps, too young. Since her days as a Seattle Weekly film critic in the late 1990s, Dederer has honed a frank and funny point of view. Dederer realized her calling in a short-story class led by UW professor David Wagoner in the late 1980s. After two difficult years, the Seattle native had dropped out of Oberlin College, a private liberal arts school in a tiny Ohio town 2,400 miles from home. Compounding her angst, the creative writing professor there had rejected her from the program, saying she wasn’t cut out to be a writer. Back home in Washington in 1988, Dederer enrolled at the UW and found Wagoner’s course. “This is such a weird story to tell, but I feel lucky to have it,” Dederer says from across a table of a Post Alley bar one evening this winter. That summer school course was a rarity. Wagoner, a Pushcart Prize-winning poet and author, didn’t often teach fiction. Dederer was hungry for a deeper understanding of the Northwest—having sought stories of place in the works of Ken Kesey, Betty MacDonald, Tom Robbins and Raymond Carver. “I was so desperate to see where I live reflected in literature,” she says. Landing a spot in the class with one of the region’s most significant poets was a gift. She has more than made up for it with two books and a raft of publications in Vogue, The Nation, Harper’s and The Atlantic, as well as Yoga Journal and Entertainment Weekly. Now nearly 50 and living with her husband, Bruce Barcott, ’88, and son on Bainbridge Island (her daughter is away in college), Dederer still haunts her hometown of Seattle. For our interview, we meet at a downtown café, only to find that it’s closing early. As a fourth-generation Seattleite, Dederer spent her childhood orbiting the University. It’s hard to understand in contemporary Seattle but the city used to be so different, she says. Laurelhurst, where she grew up with her brother Dave, ’95 (a guitarist with the Presidents of the United States of America), was a University neighborhood. Surrounded by professors and their children, the Dederers used the nature preserve around the Center for Urban Horticulture as their wild playground. Their grandfather had season tickets to Husky football games. The spine of her teenage life was the Ave. She got her first real job there at Bulldog News. She killed countless hours at the Coffee Corral and Café Allegro, and ushered, for a time, at the musty, velvet-curtained Seven Gables Theater. Lean, sharp and yoga limber, she sips wine from a tumbler and laments that more writing about the Pacific Northwest of that time doesn’t exist. To fill that void, she has stocked her memoirs with details of the city in the 1980s and ’90s—including, even, a map of the Ave., paired with memories from some of her favorite spots. A few years earlier, something similar was brewing inside her when she started her first book “Poser: My Life in 23 Yoga Poses.” In the 2010 New York Times best-seller, each chapter builds around a yoga pose as well as details of Dederer’s story of young adulthood, friends, family and becoming a mother. Dederer grapples with her sense of self while surrounded by other well-educated young mothers, all striving for some virtue in doing yoga, eating organic and raising their babies. 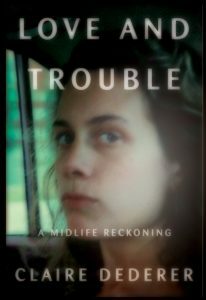 If writing memoirs is a type of intellectual yoga, with “Love and Trouble” Dederer takes a deep breath and folds a little deeper. Read one way, the book is an exploration of sexuality, self-awareness and midlife by a woman grappling with imperfections, anxieties and urges. Read another way, and it’s a requiem for a vanishing Seattle written by a woman who grew up in the era of grunge. Toews, who retired last year, was the founding director of CHID and taught classes in 19th century European intellectual history. He covered history, identity and culture—“things that Claire was just at that moment trying to get control of,” he says. During that period, Toews often saw students from private and Ivy League schools transfer to the UW. They were trying to define themselves in their own ways, not having other people speak for them, he says. Dederer was quiet in class. “But when she started writing, it was clearly obvious she was pretty advanced in her thinking,” Toews says. Dederer read Kant and Hegel, Schopenhauer, Kierkegaard and Nietzsche, and then found a home for their ideas in her contemporary experience. Capturing Seattle of a bygone era in her writing, Dederer is helping create a new regionalism for the Northwest. She points to the body of work from Southern writers like William Faulkner, Eudora Welty and Alice Walker that captures the culture and landscape of a place. The Northwest deserves that too, she says. It doesn’t matter that her Seattle isn’t everyone’s. “The true mystery of memoir is that its universality comes out of intense detail,” she says. She pauses before admitting, “I’m going a little into writing teacher mode.” Dederer leads writing classes at Hugo House, Hedgebrook on Whidbey Island and the UW. She is now working on a book about Roman Polanski and “other bad people who create great art,” Dederer says, drawing from her feminist perspective and her comparative history of ideas training. The Paris Review article published last fall will likely be the first chapter. She is returning to the theme because she wants to reason through it at a time when most are responding with emotion. Meanwhile, “Love and Trouble” is due out in paperback in April. Hannelore Sudermann is managing editor of Columns. Roseanne Olson is a Seattle-based photographer and arts educator.